There are more than 200 different types of Muscat grapes. 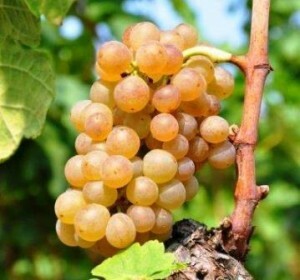 We are mostly interested in Muscat Blanc a Petits Grains, which is used to produce the sweet wine of Muscat de Beaumes-de-Venise in the Southern Rhone Valley. However, Muscat Blanc a Petit Grains is also used in the production of many wines including Moscato d’Asti in Italy, Clairette de Die, Vin de Constance wines of Constantia in South Africa, Spain, in the Wachau region of Austria for Gruner Veltliner and in many of the famous sweet wines from Rutherglen Australia as well as from select vintners in California. The grape seems to produce some of its best wines from vines planted in the Southwest of France. The grape is thought to have come from Italy, although, there are reasons to imagine it could also be of Greek origin. The fruit can take on a pink or dark red, even brown color. The berries are quite small, which is where the strain of Muscat takes its name from. Depending on the country, the grape can also be know as Muscat Blanc, Muscat de Lunel, Muscat de Frontignan, Muscat Canelli or Moscato Bianco. Muscat is one of the oldest wine grapes on the planet. It is thought that the Romans brought the vines to France more than 2,000 years ago. Muscat Blanc a Petits Grains is different than many grapes used to produce sweet wine, because it’s often the first grape to be harvested. What makes this different is, many sweet wine grape varietals are often the last grapes picked in a wine region. Muscat Blanc a Petits Grains is often used to produce a type of fortified wine that is best recognized for its dark color and strong, raisin, fig and espresso character. Those characteristics can easily be found in the wines of Beaumes-de-Venise from the Southern Rhone Valley. Due to the wines strong character and extremely sweet, rich, flavors and thick textures, when thinking of pairing Muscat Blanc wines with food, it’s often best for wine and food matches to pair with spicy cuisine, chocolate, dried fruits, nuts and a wide variety of both hard or soft cheese.